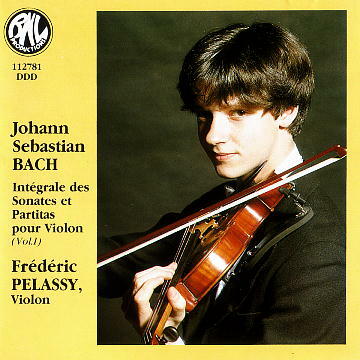 This page is to show my personal appreciation to a French violinist, Frédéric Pélassy. 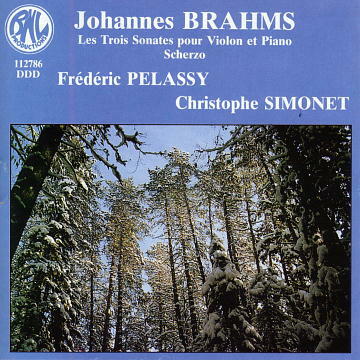 Frédéric Pélassy was born in Paris, France, in 1972. 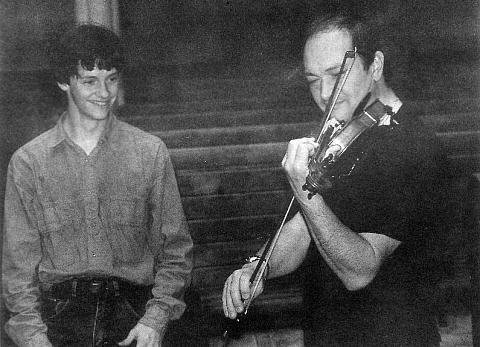 He does not belong to a group of violinists who appeal to the audience with their virtuoso techniques or their passions. He is unique in his sensitivity of showing the charm of music and also in his delicacy and clear tone character. I found out that he recorded my favorites music titles and I had a chance to listen to them. Soon I got deeply fascinated with his musical talent and beautiful violin sounds and became an avid fan of him. Now, I have finally become able to obtain all of his 18 CD titles. 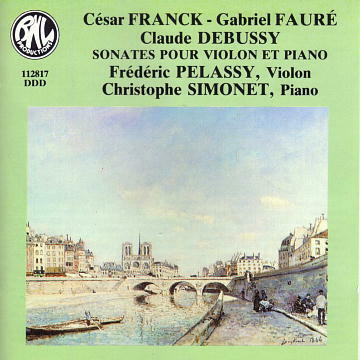 I am not good at knowing world top level violinists' who's who, and that may be one of the reasons that I have rarely heard of Mr. Pelassy's name so far in Japan. Actually, it is very difficult to purchase his CDs in Japan. With these in mind, I have started this fan page to let as many music lovers as possible to know that there 'is' such a wonderful violinist in France. I hope that I can share his beautiful performances with you and also that his name will remain in those who have visited my page. 8.572278 (P)(C)2010 Naxos Rights International Ltd. 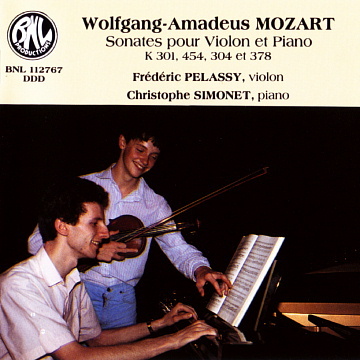 This is Mr. Pelassy's second Mozart sonata recording, though about 15 years have passed since he recorded the pieces the first time. K.304 and K.378 were also included in his first disc. Soon after the music started, I was intrigued by his own world of music. I do not often listen to Mozart violin sonatas, and that may be the reason I cannot detect what is called 'Mozartness' in this performance. His music is always natural and filled with gentleness and never sounds aggressive. He has completely built up his genuine style and the tone of his music wraps up the audience's mind. His experience in these past years has surely made him a great musician, which is a real joy for his avid fan. The performance was recorded in a studio with not much reverb. I prefer this sound quality. One thing I feel sorry is that the microphone does not seem to have been placed close enough to the performers, which causes a slight loss in clarity. His violin sound itself is so warm that catching this sound as natural as possible should be what is expected of the engineer. This package contains two discs, one of which is a regular stereo disc and the other is DTS 5.1 channel disc with the same music. I was not able to monitor how DTS 5.1 channel disc sounds like because the equipment was not available. 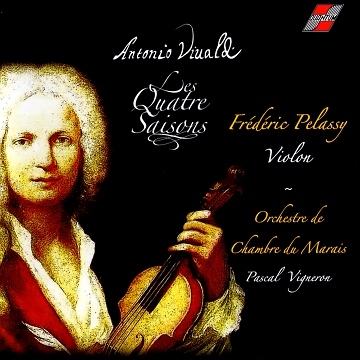 "... per due violini, basso ed organoed organo ..."
What a heart-warming playing it is! There's a cozy atmosphere all around as if you were joining a home concert while enjoying the players' happy faces in front of you. Not many violinists can create such a friendly atmosphere like Mr. Pelassey. Even when they play fortissimo, they keep that pace. The pianist has the same wavelength with the violinist. Being not too aggressive, nor too reserved, her accompaniment is just pleasant. Mr. Pelassey's tenderness has been all the more effective with the help of Ms. Fujino. The recording sound successfully makes its listeners feel as if they were at the site of the performance with such an atmosphere taken in. However, I felt some distance to the players, which seems to have pushed away his clear violin sound a little bit. I wish there were slightly more clearness and transparency in recording. In all, this disc is one of the rare cases where we can enjoy such a pleasant atmosphere. I'm looking forward to another recording by this charming duo. This is another nice and comfortable performance by Mr. Pelassy, filled with moderation and warmth throughout. Though some expressions sound reserved, which fact may become a drawback to some listeners, his violin tone has been as sweet and beautiful as ever. Repeated listening has given me the understanding of his depth and maturity. 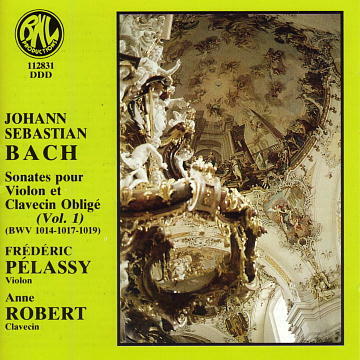 The violin sound stands clearly out of the orchestra without much reverberation, which has produced a preferable result. This surely demonstrates a good example of concerto recording. 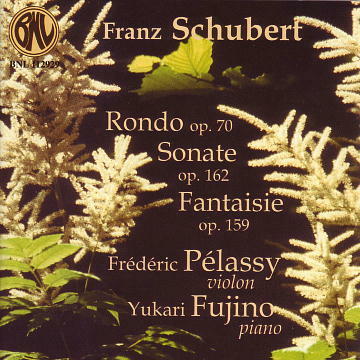 As for Cadenza, Rodolphe Kreutzer's name is mentioned in the track list, but they sound like the most popular Fritz Kreisler's. I wonder what is the truth in this case? What a beautiful violin sound with clarity and brilliance! 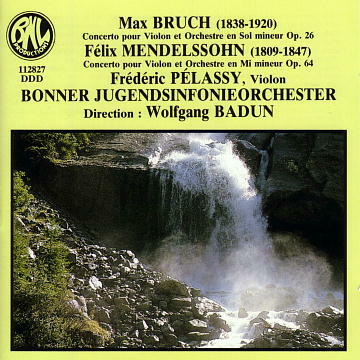 I have asked myself if there was such a beautiful Brahms violin concerto playing in the past. This performance also displays strength when it is quite proper, and never lacks the driving force throughout the music. I was really moved with this performance. He has never even tried to be like virtuoso violinists in the past. This has become one of the most favorite discs in my collection of this music. Chausson "Poem" is in the same way played with sensitivity and his delicate expressions deeply attracts me. The quality of the recording is also excellent. The violin sound has its clear focus and the tone character is so naturally presented that we can fully enjoy his violin sound. The orchestra part has quite a range and dynamics and both the solo violin and the full orchestra sound are ideally balanced. I really want to thank that such nice recording is available! These pieces were for two violins with two continuos by violoncello and organ. My first encounter with the music was by this CD, and I felt so excited to find them so charming. Originally, these pieces were intended for filling up the break between Masses at churches, but the apart from their birth story in relation to sacred situation, they are all fun to listen to. Here, Mr. Pelassy's violin sound, which is really flexible and clear, plays a vital role in expressing the real nature of the music. His playing is filled with life and energy. Among many pieces of Mozart music, these are taken as minor ones. 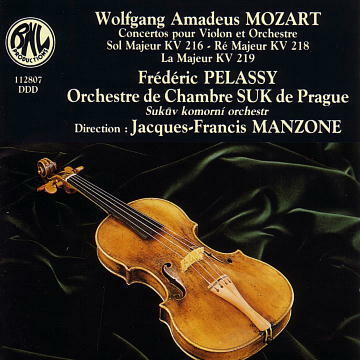 But the experience of listening to Mr. Pelassy's Mozart here will surely make us think that they are worth being played much more frequently. Three other members involved in this performance all did an excellent job, and especially the organ's charming tone attracted me so much. It meant more than just continuo basso. I should mention about the recording. 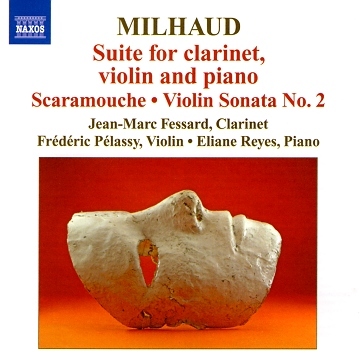 I can say for sure that this is a typical example of an ideal chamber music recording. Each instrument has clear separation from others with full frequency range. The sound is natural and clear as if each performer was playing in front of the listener. Even the mechanical function of the organ sounds so real. There surely is some resonance behind the stage, but it does not disturb the total quality at all. I usually don't like resonance, but even to me I can fully accept this naturally sounding recording!! Melodies sung with warm-hearted sensitivity go quite well with accompanying organ's rich harmony. Filled with romantic atmosphere, this performance makes listeners feel like as if they were watching a movie scene. This is especially true with those minor music. We may tend to forget that we are listening to Handel's music or baroque music. It is surprising such romantic expressive music can be carried out from baroque music played by the modern instrument. Mr. Pelassy mentions in his note that he decided to work with organ in order to emphasize the harmonic richness of Handel's sonatas. This trial has been successful in his point and also in extracting his beautiful violin tones and expressions which I mentioned above. This is one of my most favorite Handel's sonata performances. So, the only pity is that some of my favorite ones such as HWV361(Op.1-3), HWV371(Op.1-13) are missing! As for its recording, its rich acoustics help create the romantic atmosphere. 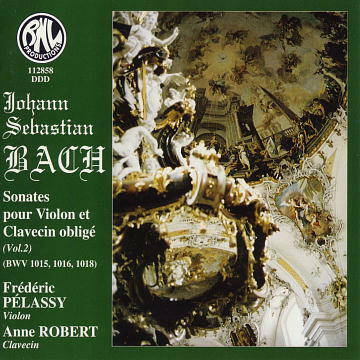 I personally don't prefer recording with much resonance, but in this case, I have a favorable impression on this recording, because both the sound of violin and organ are clearly taken in, (even the mechanical functional movements of organ) which clearly maintains his clear tone characters. The cozy atmosphere as if we were invited to a small family concert is something special in this performance! 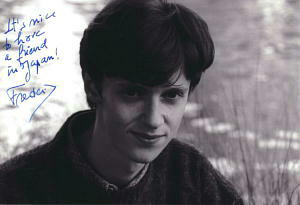 Mr. Pelassy has been consistent in enjoying himself playing the instrument and singing melodies to the fullest extent. Even the technically difficult pieces do not sound that way. Above all, his warm matured violin tone catches our ears. Mr. Villa's guitar also has a good taste and gets along well with the violin. Corelli's sonata, my favorite piece, is played with romantic flavors. Paganini's Caprice No. 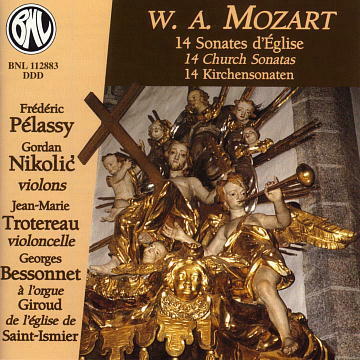 24 in this album with guitar accompaniment is played not as a showpiece but more with lots of delicate nuances. 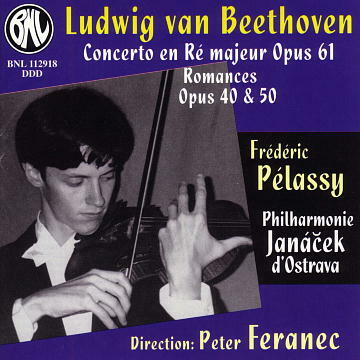 Mr. Pelassy is unrivaled in the same composer's cantabile. This recording is a typical example of my ideal sound make-up, like the one where we can feel close enough to performers as if they were playing in a family living room with no overflowing reverberant echoes. 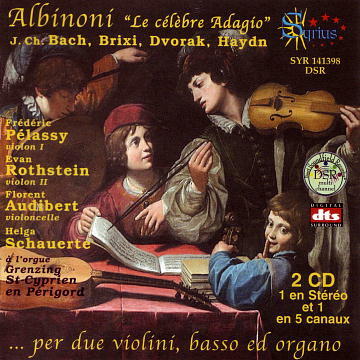 The violin and guitar sounds are carried to listeners so straight and dynamic. We can rarely obtain this high-standard quality especially from major label discs which are so much artificially processed. Let me add one special request! 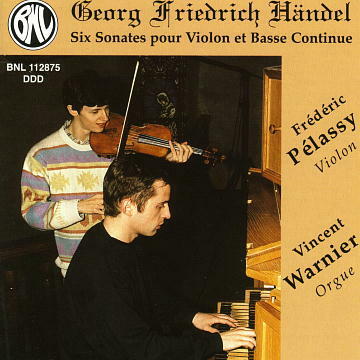 Corelli's sonata op.5 is not often played by the modern instrument. 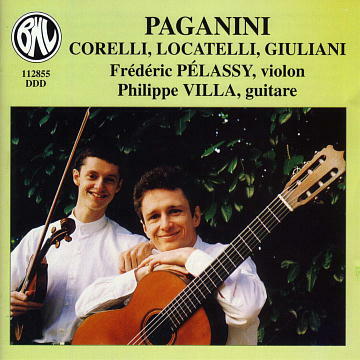 I wish Mr. Pelassy will make an album of all the Corelli's sonatas. I now have an image of wonderful playing with lots of tastes in modern style. Also, I wish to hear them with organ accompaniment like Handel sonatas. I hope my dream will come true!! What a fresh violin playing it is! In fast movements, his crisp and vivid expressions and in adagio movement his sweetness altogether come up with his original beautiful violin sounds. String ensemble vies with him in pursuing the same direction. Listening to this disc, we can feel that we share the joy of Haydn music between the performers and us listeners. This is because the musical essence of the composer purely reaches us thanks to Mr. Pelassy's nice interpretation without our being bothered with performers' insolence observed in some other cases. I feel delighted that this wonderful Haydn concertos come from modern instrument. 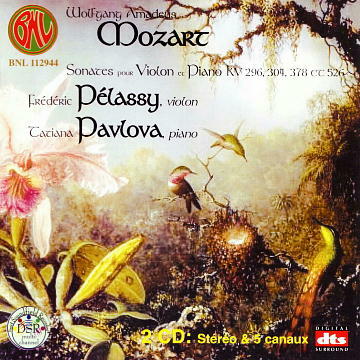 This Mozart recording simply makes listeners feel happy. Instead of exhibiting virtuosity often indicated by big name players, it is simply filled with purified elegance. Mr. Pelassy took the most advantage of his having been young at the time of the recording. His sophisticated musical sensitivity with clear articulation perfectly matches Mozart's refined music. It appears that the cadenzas were of his own compositions. They have smooth transitions and are, at the same time, filled with life and energy. 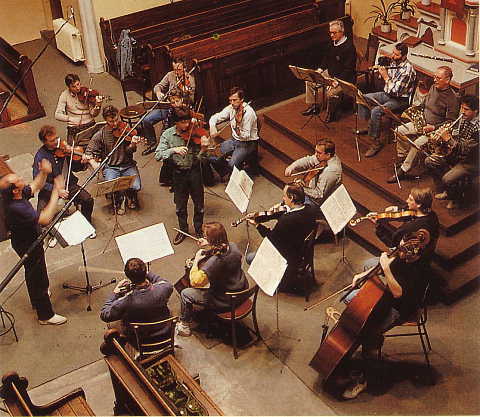 The recording was conducted at a small church with a small-sized chamber orchestra as shown in the picture in the booklet. The sound is natural and well-balanced, though with a little amount of echo at the venue. Another photo in the booklet with Mr. Manzone makes us again realize that he was only at the age of 18. His smiling face here is also a nice present for his music lovers! This is a nice performance, carefully and steadily played with good taste! 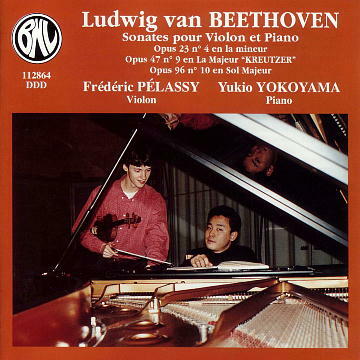 Though it may be too much to expect matured Brahms from 17-year old violinist, and after having listened to many of his recent recordings, this Brahms seems a little too good-tempered. But still, it is pleasant to feel fresh air by young Pelassy and also surprising to observe such composed style for his age. The ensemble is well-balanced (except only once at the end of the first movement there was a small flaw in their ensemble). We can fully absorb ourselves in music. The sound might have been taken in an environment with little reverberation, but it would have been better if the microphone had been set closer to them. This recording was made when he was only seventeen years old. This fact might have had something to do with the fresh and naive expressions which are advantages in the young generation. However, this is not a powerful aggressive one, but rather stands as an authentic performance with well-balanced countenance and matured flavor. I am quite attracted to the sensitive delicate expressions shown everywhere in this recording. The recording sound quality has a minor problem of having so much reverb, which as a result loses clarity and the original beauty of his violin sound. I am surprised at the fact that he has achieved such a high standard performance out of these difficult masterworks at such young age. However after having listened to other excellent recordings made in recent years, my honest feeling is that I would like to listen to his Bach again NOW!! I hope he will have a chance to make a recording again in the future. How genuine and feathery delicate performance! We feel the virtue of modesty in music and love for Mozart. 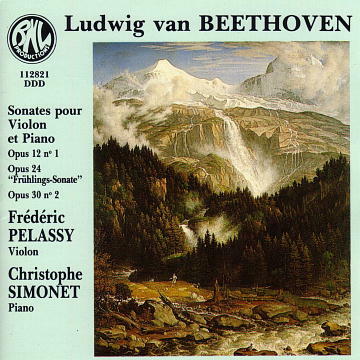 His artistic sensibility is shown in some matured expressions, but at the same time he does not sound brave enough while trying to follow Mr. Simonet's piano accompaniment. This may just be clear after we have listened to his latest recordings. The sound is of high quality with clear edge of violin tones, although we hear a little too much reverb. I personally prefer still less reverb on the recording. As for the balance between the violin and the piano, the more focus had better been given on the violin part.